Josh Githens seems pleased with his position in this semi-final game. The survivors yuk it up in a now empty ballroom as the Final gets underway. For 2007, we used the same format that KOSMOS uses for their tournaments in Europe. This has each player placing a settle/road, a city/road, followed by another road. This gets the game off to a quicker start. It also helps keep the games moving along with 90 minute rounds (including set up and initial placements). The format continues to work well as we had only two games 'called' due to time. When that happens, the current player finishes their turn and points are then totaled. The only change from previous years was that the Robber IS allowed to be re-placed by playing a Knight card before your die roll. This is a normal rule for the game and is back in the tournament via KOSMOS. The tournament format has players settling during three preliminary games. Each of those games earns Tournament points. Points are awarded based on placing 1st, 2nd, 3rd, or 4th. The 16 highest scoring settlers, at the end of three rounds, advance to the semi-finals. For those unable to commit the time to play three qualifying games, we continue to accept drop-ins and drop-outs. My thanks go out to those who notified me prior to dropping. To those who dropped without saying anything, it would be a great boon for those playing in subsequent heats (as well as for your friendly neighborhood GM) to notify me or either Assistant before leaving. It makes the subsequent tables easier to seat. We set a record for the most players in the tournament since going to this format. Either people like it or there is nothing else to do on Saturday! 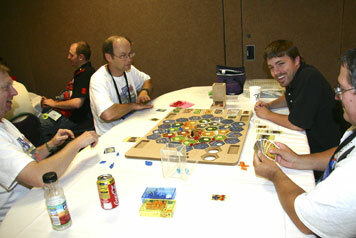 Our players played in nearly 100 games of Catan. After the three preliminary rounds, the number crunching for the top 16 began. For the past years, a total of at least 11.X tournament points were needed to advance. This year was no exception. After posting our 16 semi-finalists and three alternates, we ended up needing the first alternate. This was a first, but serves as a reminder to check in if you're an alternate! Our 16 semi-finalists saw a few familiar faces with former laurelists Pierre LeBouef and Rick Dutton plus ex-Caesar James Pei, in the penultimate round. After the sheep were traded and Knights played, the four Finalists were determined. No tie breakers were needed for 5th and 6th place this year. Interestingly enough, Rick Dutton was undefeated while returning to the Final for the second straight year and our alternate, Tom Stokes, was still in the running. The Final match of the day began on time after a short break. Pretty good starting positions for all were obtained. Of the first three Development cards played, two were Monopolies! Big exchanges of cards occurred when that happened. Rick Dutton was off to an early start with seven points, pursuing both the Largest Knight Force as well as Longest Road. Josh Githens was at six pts with the Longest Road and recovering from being assaulted by Robbers and the Monopoly cards. Jon was holding his own at seven, Tom was sitting with six points and a pile of Development cards. The race to 10 continued. The 'trade boycott' was instituted. All eyes were on Jon and Rick with nine points each with Josh and Tom trailing with six points. Everyone was watching to see whether Jon or Rick would make the next build. Tom rolled his dice, built his city, bringing him to seven points and then turned over three Development cards worth a point each. A surprise victory by our alternate who snuck across the finish line in unexpected fashion much the same as he entered the semi-finals! Beware those with a second chance! Congrats to all and I hope you?ll join us next year. 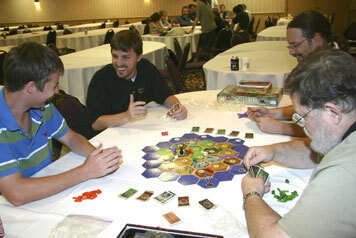 GM Brian Sutton oversees a group of little settlers. These pint-sized settlers have their own gallery of fans. 19 little Settlers contested the WBC Settlers of Catan Juniors title. The best of these proved to be Jennifer Sutton again who repeated as Junior champion followed by Ben Gardner, Nathan Taylor, Andrew Doughan, Virginia Melton and Mary Beth Mitchell.